Once, there was a time when you could say you liked REO Speedwagon, even say REO rocked, and not get looks ranging from disbelief to dismay to disgust. Homercat discussed this in more passionate detail on his blog Good Rockin’ Tonight last year. I’ll just add this. Those of us who grew up in the upper Midwest in the early ’70s remember REO — fellow Midwesterners — as a hard-rocking fixture on the FM radio of the day. It was a time long before their power ballads. “R.E.O. T.W.O.” was one of my early album purchases. I probably bought it in the record department at Prange’s in Wausau, Wisconsin. It’s still one of my faves. Homercat offered the last cut, “Golden Country,” when he wrote about REO last year. That’s a good one, and probably the one that got the most airplay. Lead guitarist Gary Richrath wrote that one, and he wrote this one — my favorite cut. 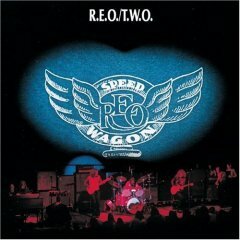 “Like You Do,” REO Speedwagon, from “R.E.O. T.W.O.,” 1972. Also available digitally. Thanks to Homercat for getting the ball rolling on this discussion. He’s long been a friend of AM, Then FM. Sorry it took so long to follow up. But, as we say, late to the party as usual. I’ve seen REO Speedwagon in concert several times and not once did they “mail it in.” Kevin Cronin, Gary Richrath, Neal Doughty, and Bruce Hall rocked their asses off each and every time I’ve seen them. In 1985, I saw them in Green Bay, Wisconsin. I was hanging around near the sound and light control board where an older couple (probably in their early 60’s) was also nearby. I made some small talk with them and found out that they were the parents of Kevin Cronin. They also had a son, Sean, who was a meteorologist for a TV station in Wausau, Wisconsin. It was the week of Thanksgiving and they were getting the whole Cronin family together there while REO was on tour. I was great meeting them. As for the show, they played their ballads early, much to the delight of the tenny-boopers in the audience, then they rocked-out…playing “Golden Country,” Back on the Road Again,” and “Ridin’ the Storm Out” as part of a very long encore much to the delight of us “older” fans. I’ve also seen REO several times, and it grieves me to see people sitting down politely clapping after Kevin Cronin croons out another mindless ballad. For God’s sake, you’d think you were at a symphony instead of a rock concert! Then, the guy talks your ear off for half an hour between songs bragging about tunes Gary Richrath wrote! REO is a washed up, crappy cover band riding on the coat tails of one of the most under-rated guitarists of all time — GARY RICHRATH!! Cronin ought to be shot for ripping him off and kicking him out of the band. I have nothing against th’ Wagon, but…rockin’? This song? Nah. More like mild groovin’ with overdriven guitar. Thanks for the plug. Indeed an excellent album, and for a great overview how good they were, the live album, You get What You Play For, is killer. Richrath’s guitar is outstanding. Great post. REO? Say it ain’t so! You’re blog’s still full of fun.